The School of Continuing Studies (SCS) has been offering a number of services to support its students and recent graduates as they prepare for the job market or a career transition over the course of their studies or upon graduation. 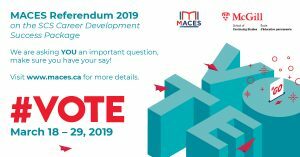 Since the last referendum in 2016, the School has provided more than 10,000 students with career development events, workshops, individual advising sessions, an annual job fair, and more, with limited resources. With each of us having varying professional goals, it has become more and more important that specialized career services are made available to SCS students if we are to achieve our individual professional goals. What is the McGill Writing Centre (Tutorial Service)? What is the overall inherent value of the SCS Career Development Success Package? Individual services included in the SCS Career Development Success Package would typically range from a few hundred dollars for individual consulting, and upwards of $2000 for professional development workshops. The overall value is dependent on which services you use. Do undergraduate and graduate students in degree programs pay fees for similar services? Who does this fee apply to? All students enrolled in credit and non-credit SCS programs are subject to this SCS Career Development Success Package fee. Are SCS alumni eligible to use the SCS Career Development Success Package? With the exception of the MWC Tutorial Service, all SCS Career Development Success Package services are open to SCS alumni. Who has benefited from CATS services? What happens in the event of a *No* vote? In the unfortunate event of a *No* vote or a failure to meet quorum, some services would have to be eliminated, others would have to be limited and, in addition, no further program development and/or expansion could take place until and if a future referendum would pass.